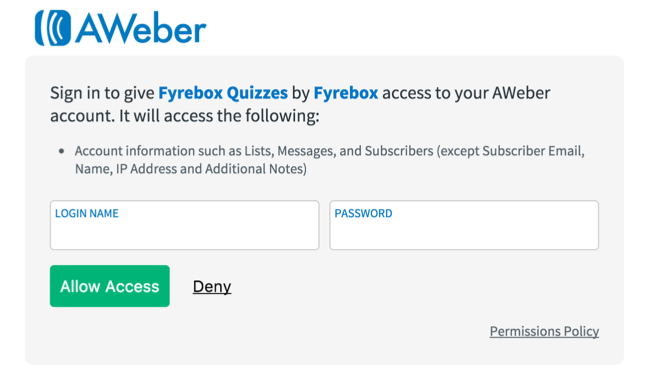 Upon logging in, you will be asked to authorise Fyrebox to Manage your list and Subscribers. This is required to display all your lists and add a subscriber to one or more lists. After successfully connecting both accounts, set up your quiz to send data directly to any list. 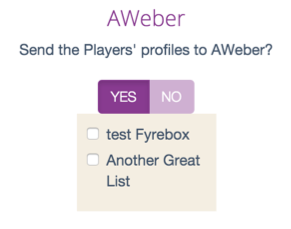 After you have selected one or more lists, the quiz will send the contact information of the players automatically to the list you have selected. If you’ve never heard of it:Aweber Communications has been a player in the email marketing game since 1998 and claims to have over 115,000 customers with average deliverability and volume of email deliveries that far exceed their competition. They make the further claim that getting your email delivered to your subscribers as their top priority.